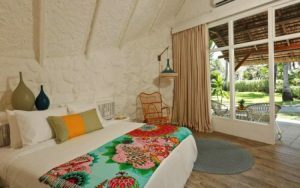 All of the bungalows have their own comfortably furnished rooms and a terrace looking out into the majestic coconut grove. The bungalows are made of volcanic rock and have traditional Mauritian thatched roofs. At La Pirogue Hotel Mauritius, they are arranged as a little fishing village. 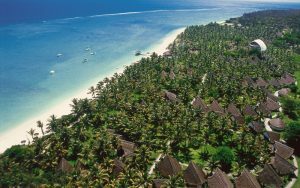 Each area of this charming coastal village is named after a tropical flower found in Mauritius. Rooms have individual air-conditioning and are furnished with either a double or two single beds. Each of the bungalows has a mini bar, a room safe and an LCD television with international satellite channels and a cartoon channel for children. WiFi is available for a supplement. Choose from standard rooms (some have interconnecting rooms) which will sleep 2 or 3. Slightly larger Superior rooms, which will sleep 2 adults and 2 children under 12. 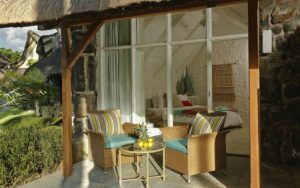 La Pirogue Hotel Mauritius has 2 Suites, “Flamboyant” and “Bougainvillaea”, which provide accommodation for two adults. The spacious living room and dining area lead onto a separate bedroom with en-suite bathroom which has a shower and Jacuzzi tub. A flat screen TV and a Home Cinema are also part of the Suite facilities. 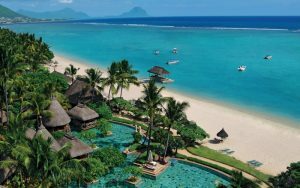 With its warm atmosphere, wonderful beach, exquisite restaurants, lively bars, Aura Spa and the possibility of having a go at all kinds of recreational and sporting activities, this wonderful Mauritian hotel promises guests a memorable stay. 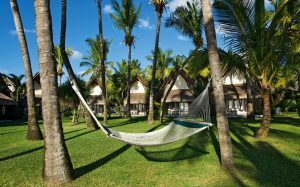 La Pirogue Hotel Mauritius nestles in 14 hectares of magnificent tropical gardens where the fragrance of hibiscus and frangipani permeate the majestic coconut grove. 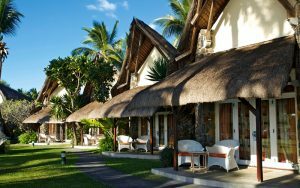 La Pirogue Hotel Mauritius invites you to discover why it deserves its great reputation. From relaxing by the impressive main pool overlooking the Indian Ocean, to the professionalism of its water sports team and the wood and thatch of its charming restaurant. If you’re looking for a moment of total relaxation you can soothe your soul at the Aura Spa. Treatments are given in a calm and luxurious environment. You will be able to choose from massages, facials and other treatments promoting the well being of body and mind. Truly a chance to relax and indulge yourself in beautiful surroundings. 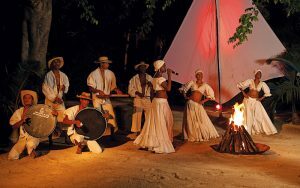 Every evening, you are invited to dance as the resort swings into life to the rhythm of its orchestra. The extensive events calendar ensures that different shows are put on several times a week for the entertainment of the guests. 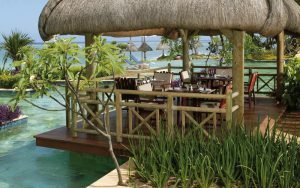 Thatches is the main restaurant at La Pirogue Hotel Mauritius. 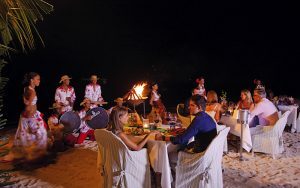 The restaurant’s tropical style is in harmony with the hotel’s traditional Mauritian theme. The choice is all yours for breakfast. Choose from crumbly croissants and sweet pastries, made-to-order pancakes, hot and cold meats, eggs, and other tasty delights for you to construct your perfect breakfast. Thatches offers 6 themed culinary experiences for unique outdoor dining. The Asian corner with its wok for stir frys, the curry corner complete with a Tandoor, used for preparing certain Mauritian recipes, not forgetting the salad bar, the grill, the pasta bar and the wood-fired pizza oven. Those with a sweet tooth will adore our desserts and selection of delicious ice creams. 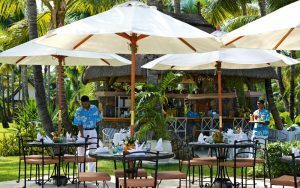 Paul and Virginie, is a true Mauritian restaurant that serves la carte Mauritian food and has gorgeous views of the lagoon and the majestic Le Morne Mountain. Tables are arranged under little cabanas dotted around the pool with panoramic views. Among the seafood and other sauteed dishes served at dinner are delicious spiny lobsters, giant prawns, oysters and even scallops which are prepared to order according to your preference, grilled, smoked or steamed. Tides is a joy for all the senses. At this beach restaurant, the food bursts with creativity and flavour and, naturally, celebrates the sea. Citronellas Café is an Italian restaurant at La Pirogue Hotel Mauritius. It offers dishes that are full of character, authentic cuisine inspired by traditional regional Italian recipes. 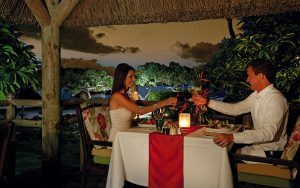 As it is the case in most restaurants in Mauritius, La Pirogue Hotel Mauritius requests that gentlemen wear long trousers and a collared shirt or polo shirt for dinner. The Blue Bar drinks menu offers a fantastic choice of contemporary tropical cocktails, Mauritian flavoured rums and a wide choice of refreshing drinks, liqueurs, beers and branded spirits. It is also the perfect place for mid morning coffee. Coconut Café is found near the pool. Relax next to the pool with a coconut cocktail, made with or without alcohol, served in a coconut. The café also serves freshly squeezed juices, seasonal tropical fruits and has a pizza and pasta menu. The Beach Bar is next to the water sports centre overlooking the Indian Ocean. drinks menu is also packed with milkshakes, a superb selection of coffees and of course a wide range of alcoholic and soft drinks. 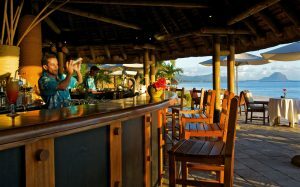 Soak up the relaxed atmosphere of this Mauritian beach bar and enjoy the stunning view of the lagoon. 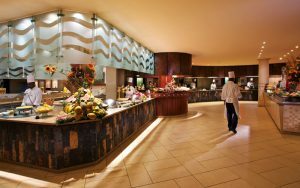 The bar serves a selection of snacks and light meals including Mauritian treats, sandwiches, burgers and exotic ice creams. Guests with a sweet tooth will want to try its pancakes and cakes as an afternoon snack. 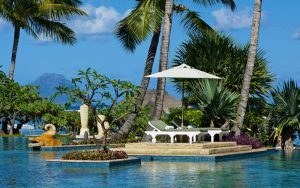 La Pirogue Hotel Mauritius offers a variety of sports and leisure activities. All you need to do is ask at the Water Sports Centre. 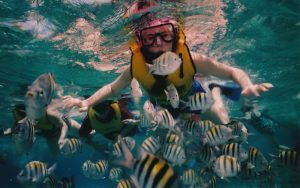 Have great fun kayaking, laser-sailing, hopping on board glass-bottomed boat trips, snorkeling and wind-surfing. You can play basketball, water polo, mini-football, mini-golf, table tennis, pool, beach volleyball and badminton as well as tennis. You can attend free aerobics, yoga classes and aqua-gym sessionsthere is also a fully equipped fitness centre. The centre has a Martial Arts space for fans of kickboxing, judo and karate. The hotel offers, for a supplement, diving excursions (with the possibility of PADI lessons), deep-sea fishing, parasailing as well as banana-boat rides and catamaran trips. Mountain bike excursions and archery lessons are also available. 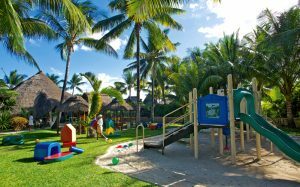 A holiday is fun for all the family, and staying at La Pirogue Hotel Mauritius ensures all tastes are catered for, with activities to suit all ages and interests. Open 12 hours a day, the Sun Kids’ Club welcomes children aged 2 to 11 years in a safe and fun environment. 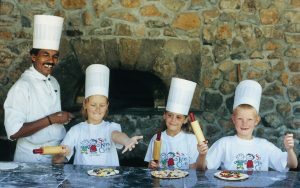 The Kids’ Club is staffed by our qualified and experienced team members who are on hand to listen to your child’s needs. Thanks to especially designed equipment and the creativity of our team, the Sun Kids’ Club provides a wide variety of both fun and educational activities that focus on your children having a good time. 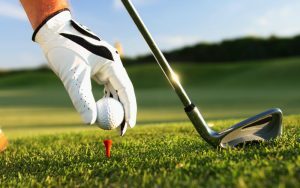 Mini golf, tennis, wind-surfing, swimming and excursions are some of the many activities on offer. Activities are also available for teenagers aged between 12 and 17 years at the Teens Club. Offering sports, trips, excursions and party nights. 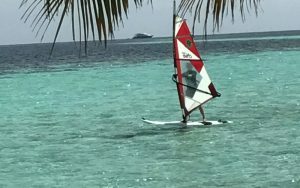 All of the activities are specially organised for teenagers under the supervision of La Pirogue hotel’s experienced team.